It's that time of year again when my amazing friend Marissa of Rae Gun Ramblings hosts her annual Harry Potter bonanza for all us Muggles! There will be tutorials, inspiration, giveaways and so many amazing blogs. If you have ever dreamed of attending Hogwarts or playing quidditch, then you will have to join us for the magical blog ride. 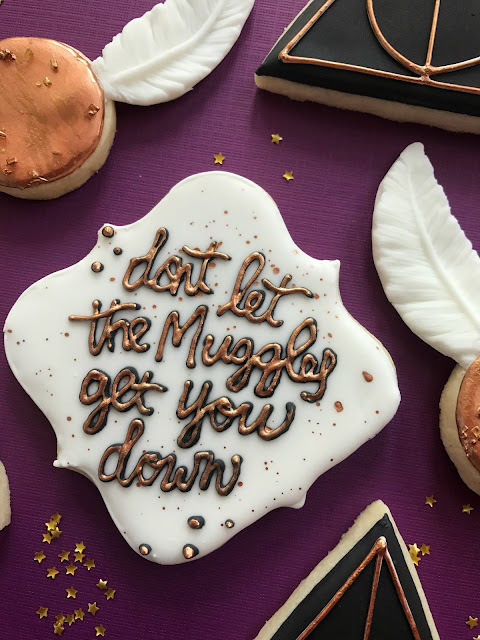 I thought long and hard about what kind of cookie I should create for this year's Harry Potter party. I wanted to create a set that might speak to an older crowd - refined and dramatic. I worked with a small color palette and selected a few visuals to play with. There has always been something about the quidditch game that I loved. Or maybe I just want to ride around on a broom. 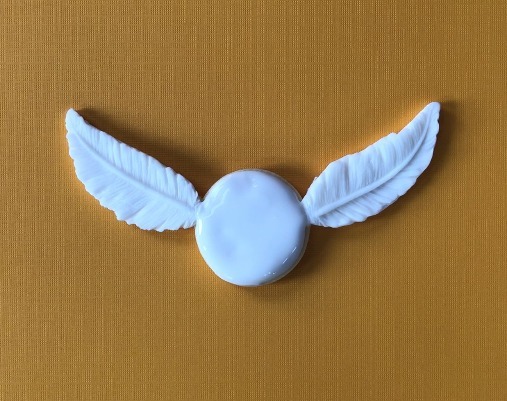 I wanted to create a golden snitch that would be magical and a new cookie style. 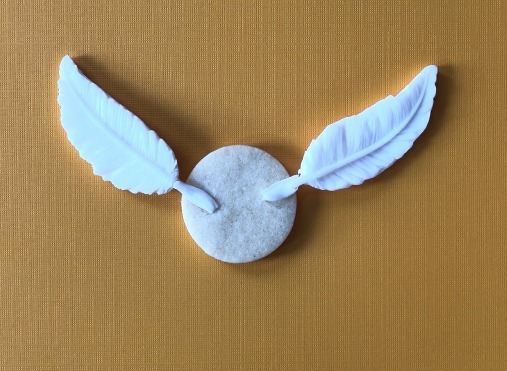 For this snitch, I've added white fondant wings for such a fun way to create dimension. 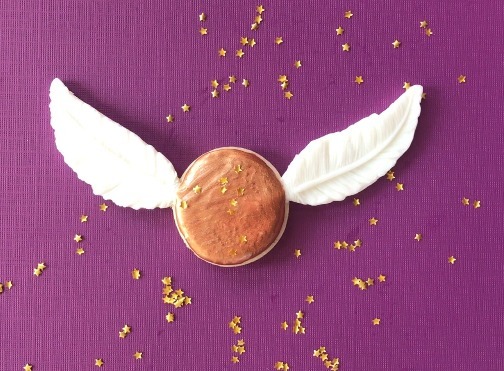 The first thing you need to do to create these flying, golden snitches is to create the fondant wings. For this cookie, I actually used a feather mold - I liked how delicate and long this particular mold was. Take a small bit of fondant (homemade or store bought) and push it into the mold. Place in the freezer for about 10 minutes and pop out. I let mine stiffen up overnight in a cool, dry box. Create 2 feathers for every snitch cookie that you are making. Next you will position the fondant feathers on your round cookie. Gently press and flatten the fondant ends of the feather into the cookie. This will help anchor the fondant and make it more stable. Now outline and flood the cookie in white icing. You will completely ice over the area of the fondant that is on the cookie. Allow to dry for 10 minutes in a dehydrator at 90 F or at room temperature for a few hours. 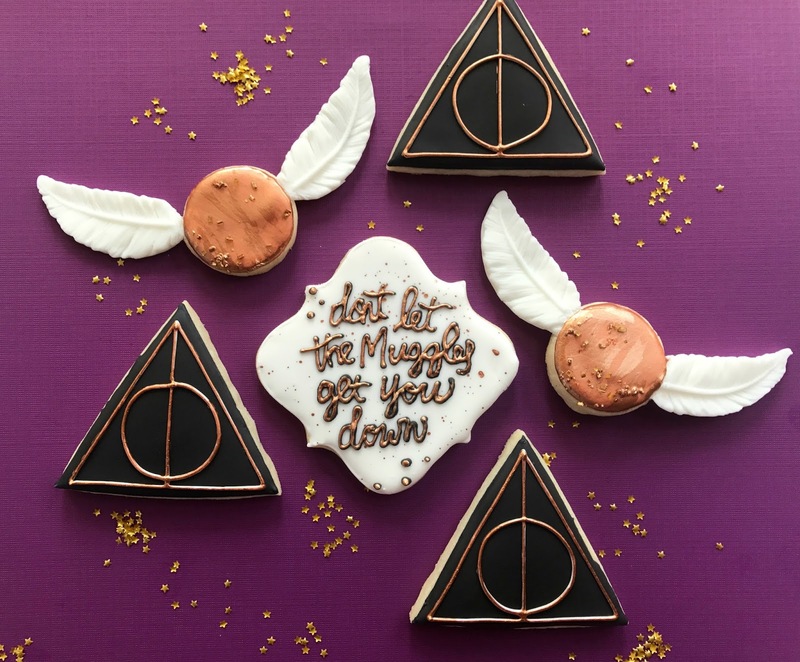 Your final step to finishing the golden snitch cookie, is painting a layer of edible gold paint all over the cookie. There are a number of options on the market, just choose your favorite. This adds such a gorgeous sheen. 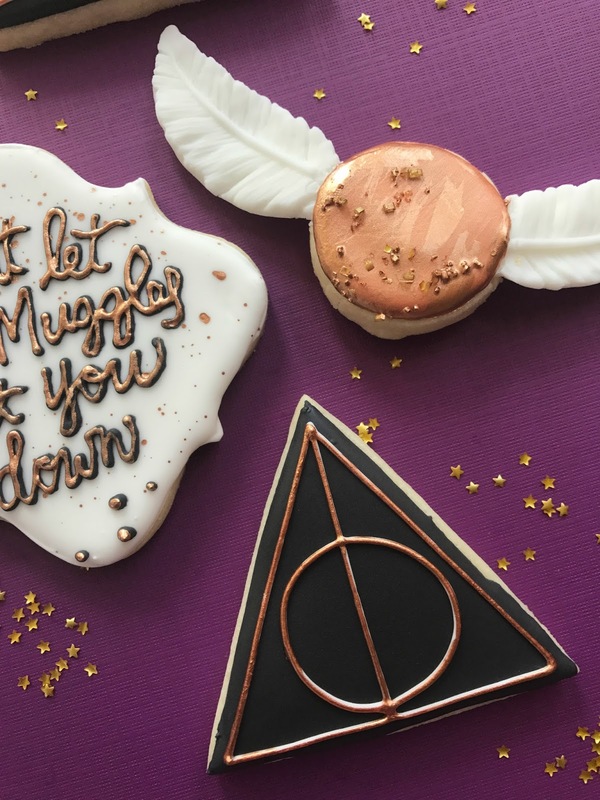 Your Hogwarts fans, old and young, will love this sparkly cookie! I added a few edible stars and sprinkles while the gold paint was still wet. Aren't these quidditch cookies a showstopper?! They are fragile, so please treat with care and this may not be one that you will want to ship. 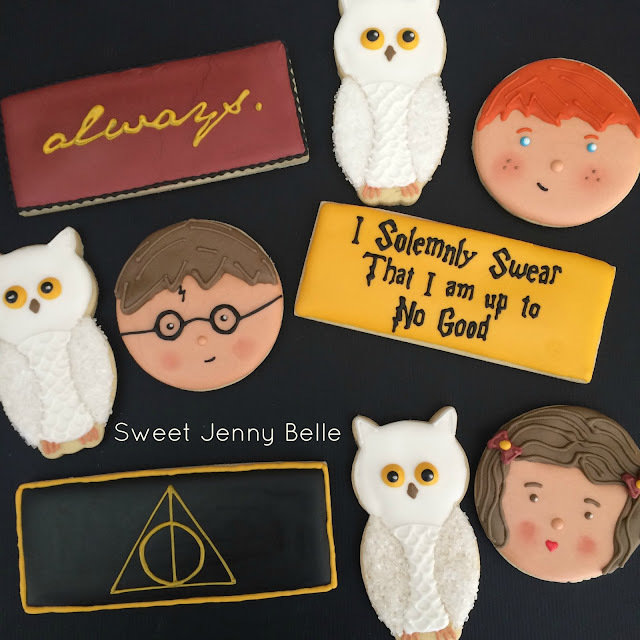 However, they are easy to make and I think are my most favorite Harry Potter cookie to date. Want to see a quickie video of creating the cookie? Unfortunately it was crazy overcast in Washington and my hands have a weird purple hue in the video, but it will show you exactly how I made mine. Bookish Swag from CrateJoy which has loads of HP and fandom related subscription boxes. Four Stunning Harry Potter Printables from Sisters What! Are you looking for more Harry Potter cookie tutorials? Come visit the Harry cookie I created last year! And of course, lots more inspiration cookie ideas for your party or client! They look so yummy! Thanks for sharing! My name is Jenny and I bake cookies. © Sweet Jenny Belle - easy sugar cookie decorating, dessert recipe and fun cupcake recipes. Design by MangoBlogs.